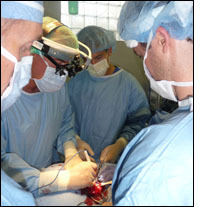 On June 7-12, 2010, I accompanied a surgical team to Haiti through the St. Boniface Haiti Foundation. Our team traveled to Fond-des-Blancs, Haiti, an area in rural Haiti approximately 60 miles southwest of Port-au-Prince. I have been going to Haiti for 7 years, and this was my 20th trip there. I lead surgical teams to the St. Boniface Hospital in Fond-des-Blancs. The hospital is a 60 bed hospital, with 6 full time Haitian doctors and 60 additional staff members. At this hospital, we are also caring for a number of patients with spinal cord injuries which occurred in the earthquake. Due to such, there was a need for a thorough urologic evaluation of these patients. We also have been bringing teams of Physical Therapists and Occupational Therapists with us to meet there needs. We received these patients after they had initial care on the US Navy Comfort Ship, and no other facilities were willing to assume their ongoing care. Our foundation has committed to opening a long term rehabilitation center for these, and similar, patients. Therefore, we brought two teams with us this time, consisting of 14 individuals. The surgical team performed 32 surgeries, including a gall bladder removal, thyroidectomy, mastectomy for a very advanced cancerous lesion, and a number of hernia and hydrocoele repairs. The urology team performed cystoscopy on the spinal cord injury patients, and also ran a clinic to evaluate patients for urologic problems. They treated a number of patients with Benign Prostatic Hypertrophy, and performed surgery to repair a vesico-vaginal fistula. Members of our team came from Jacksonville, Florida, from which we run the surgical trips, but we also had medical personnel join us from New Jersey as well as California. I have been leading teams down to Haiti 3-4 times/year for the past several years, and can honestly say, this was one of the busiest but most productive trips I have been on. I appreciate the support of the Benjamin H Josephson Foundation in making this happen.